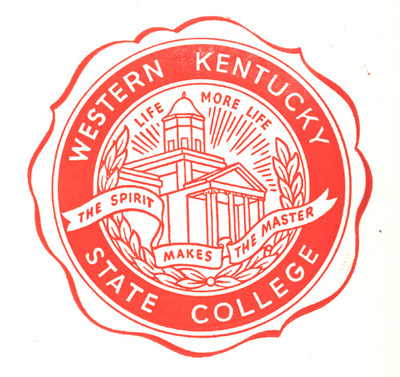 The Kentucky General Assembly changed the name from Western Kentucky State Teachers College to Western Kentucky State College. This seal was designed by Kelly Thompson and replaced the seal created in 1911 depicting Van Meter Hall. The professional rendering of the seal was done by the S.K. Smith Company of Chicago. The seal was used until WKU was granted university status in 1966. At that time Western Kentucky State College was replaced with Western Kentucky University.